CITY BEACH stretches from the Hotel „Zagreb“ to the „Black mall“. It's a sandy beach with lots of restaurants, bars, playgrounds for children and young people. There are also all kinds of sports activities, like – diving, sailing, having fun on acquaguns and other kinds of amusements. 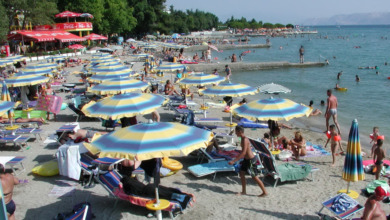 “PODVORSKA” BEACH is situated right in front of our house, very near to the yacht bay (“Lučica”), where you can have a drink or a meal in one of a few restaurants and bars. There are some showers, too. Close to this beach there’s the one for dogs, separated from the first one. THE COASTAL PROMENADE BEACH stretches from the center of Crikvenica to the Hotel “Zagreb”. 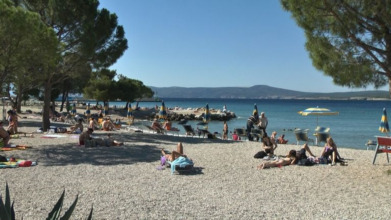 It is mainly pebble beach where you can, except swimming in the beautiful sea, have a snack, buy an ice-cream or rent a deckchair with a sunshade, as well.